Dynaudio DM 2/6 review | What Hi-Fi? Looking for a small, yet still powerful sounding speaker? Dynaudio's new entry-level standmounter, the DM 2/6, is it. These are small, standing just 29cm high, but hear one in full flow powered by the likes of Naim's Nait 5i or Cyrus's 6XP and the speaker's presentation is surprisingly assured. It goes louder than you'd expect for a box of this size and isn't afraid of high bass levels at those extended volumes, either. Play the likes of Tinchy Stryder or Lady Gaga at party levels and these baby Dynaudios will shine. That's not where the good news ends. 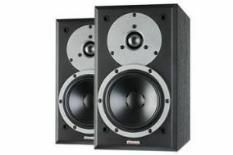 Like its much-admired big brother, the DM 2/7, these monitors are fine all-rounders. Tonally, they're well judged with just the right balance between highs and lows to make things sound even. Detail levels are also good, the speakers delivering enough insight to make even a complex piece of music such as Steve Reich's Music for 18 Musicians make sense. Add strong dynamics, punch and a decent sense of timing to the plus points and you have a strong rival for the likes of the class-leading EB Acoustics EB1s. The EB1 holds an advantage in outright transparency and resolution, but the Dynaudios counter with a more robust presentation. These speakers are relatively unfussy about positioning – just place them around 15cm from a rear wall and they'll sound fine. Don't forget to budget for a decent pair of stands: we got pleasing results with the Atacama Aurora 6s and Partington's Super Dreadnoughts. Build and finish are about what we'd expect for the money, and like most lower-end Dynaudio products there's little glamour in the looks department. The DM2/6 may appear rather unassuming, but they're one of the few standmounters at this price level that can be mentioned in the same breath as the EB1s. That alone makes them worthy of attention.